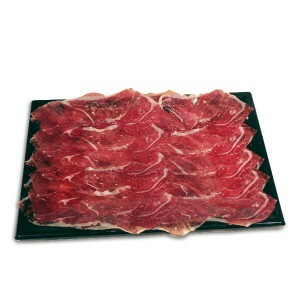 There is nothing better for your party, celebration or event a good sliced Iberian Spanish ham. 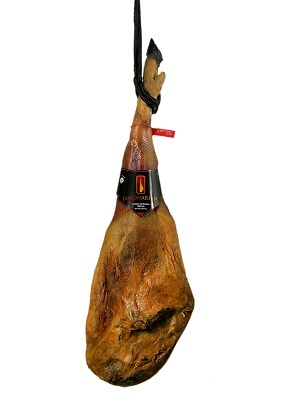 We present our Spanish ham in different forms, sliced in trays of 400gr, sliced in 100gr sachets and whole leg hams. We also have other products that may interest you for your catering as Manchego cheese, beef cecina, Iberian charcuterie, wines and champagnes, etc. The best presentation for your catering, ready to serve at your meeting, birthday party or trade show stand. The trays are vacuum packaged at low pressure with which the product is not squashed. That makes it a perfect presentation for your lunch, brunch or dinner. The best Iberico ham, intense flavor and fruity, with more than 36 months of curing time and native from Extremadura. Ham with optimal fat infiltration characteristic of the best "pata negra" iberico. Sliced and low pressure vacuum packaged so it doesn’t squashed, ready to serve. Our Iberico “pata negra” ham has more than 24 months of curing time with care and controlled by highly experienced master ham. Raised in Extremadura, Our Iberico ham is high quality, with great flavor, ideal for those who want the best Iberian at the best price. Tray low pressure vacuum-packed to retain their best aroma and flavor. The Iberico Bellota shoulder ham tray is a gift for the gourmet lover, with more than 24 months of curing and a spectacular juicy flavor is ideal as a main dish, as a aperitif or as tapas. Tray low pressure vacuum-packed to retain their best aroma and flavor. Ready to open and serve. The "pata negra" at best price. Cebo shoulder ham tray is ideal for parties and family celebrations. Over 18 months of curing time. This shoulder ham gives us a taste and texture vigorous juicy. Tray low pressure vacuum-packed. Ready to open and serve. Bellota Iberico cured sausages, elaborated in the traditional way. Tray with the three Bellota products (Chorizo, Salchichón and Lomo), peeled, so the slices don’t stick each other, and low pressure vacuum-packed. Three types of cured Manchego cheese in triangles fine cut and with a beautiful presentation. 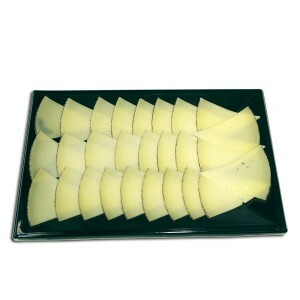 Types of cheese: dry cured Manchego sheep, Manchego sheep cheese and semi-dry blend of three milks semi-cured. Tablett mit Bellota Wurstwaren (Lendenstück, Chorizo, Dauerwurst) 450gr. Another option for your catering are the whole Spanish hams and shoulder hams. A whole piece with a ham holder and a knife can live up any evening or an event with a group of people. Ideal for a dinner or lunch with friends in which, by turns, everyone can try to slice a bit of the ham or shoulder ham. We have videos explaining how to cut a ham and how to cut a shoulder ham. 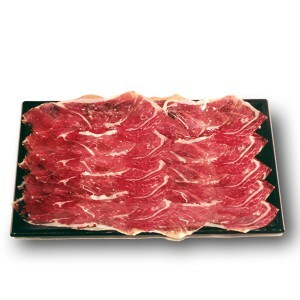 The sliced Spanish ham can be ordered in two different ways, in trays or sachets. Ham 100g sachets are handy for dinner parties or events where we do not know how many people attend or to have them stored in the office for improvised meals or bussines meetings. Can be stored in the refrigerator or in a cool place and should be open 15 minutes before serving to recover the original aroma and temperature. We have a selection of wines and cavas (Spanish champagnes) to join our products. To complete the catering trays, sliced or whole ham you can choose a few bottles of wine from Rioja, Ribera del Duero, Somontano, etc.. In the cava we have it clear, we will seek high quality at a great price through small family wineries that produce small jewels of this brebage so present in our celebrations. 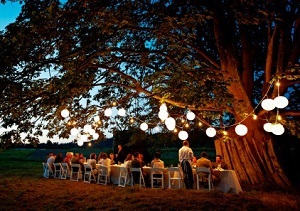 We propose you customized caterings depending on your type of event or meal. Our catering can take many forms and variations depending on the occasion, the presentation and the place will be served. We would like to show you some of the options we have already prepared. Contact us to customize your own special catering, by email or filling up the form. When you order a special catering that suits your needs, we send it to your addressee with our courier companies and an ideal packaging so it arrives in perfect conditions. If you are in Barcelona and you prefer to pick it up in our shop we’ll be glad to meet you. This is interesting for those on holiday in Barcelona and want to come back home with a typical Spanish cateringand you live in a country where we are not sending orders. For special celebrations such as weddings, baptisms and communions we can prepare a custom catering based on our products, sliced Spanish ham, cut cheese, sliced beef cecina, etc. We suggest that you contact us (fill in the form) in order to make you a special proposal for catering and adequate budget to the number of guests and other food dishes of your meal, lunch or dinner. In addition to the sliced products (ham, sausage, cheese and cured sausages) we can offer you whole hams and shoulder hams with ham holder and knife to cut them in place. We can recommend a good ham cutter for this kind of events. 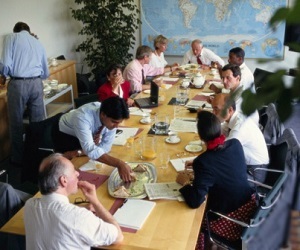 For business meetings and improvised meal in the office we propose you Bellota ham trays as a great solution. For these occasions we offer you Bellota Iberian ham sachets, the best Spanish ham, which can be stored in the office kitchen so when the right day comes you have a great meal just open a eat. Take advantage of prices of the whole sliced Bellota ham. If you work in an event management company and you need catering for your clients please contact us and we will find the right formula for your structure. We can offer to send the product to your office or directly to the place where the event is organized so you won’t need to carry the product with you. Your company is setting up a stand at a national or international fair or trade show. There's nothing better to offer to your future clients than Spanish “pata negra” ham and sliced iberico cured sausages. 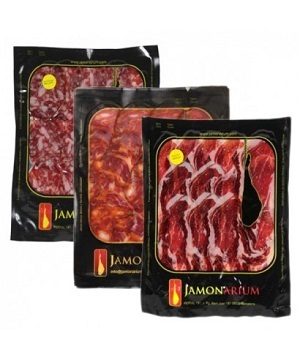 We can send you trays of Iberian ham low pressure vacuum-packed so that you can open them during the exhibition fair or show in your stand. We can send it directly to the exhibition center and you won’t need to store it in the refrigerator. 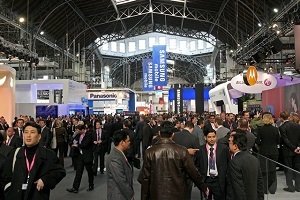 Exhibitions in which some businesses have been closed eating our ham: Feria de Barcelona, Feria de Madris, Feria de Valencia, Feria de Bilbao, Foire de Paris ( Paris Expo), Feria del libro de Franckfurt, Good Food show London (Olympia Exhibition Center), LumiBat Lyon (Eurexpo Lyon), etc. Are you organizing a party for your birthday? or you want to celebrate spring with your cousins? 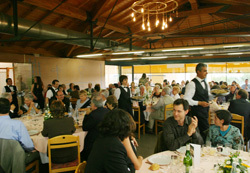 or you organize Saint Georges dinner for your neigbours? 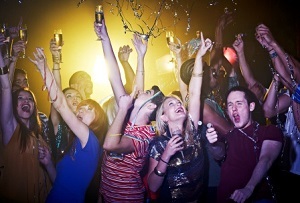 We can make it easy for you so you can stand as "great organizer" of parties. Contact us and tell us how many people you are and what is the plan to eat. if it’s a meal, or tapas lunch, or something to eat to accompany the cocktails ... We will advise on the numbers and the best way to present it. Without worrying about anything you can organize a big party-event with our catering Spanish ham, sausages, cheese, cured meat, wine and champagne, peasant bread, some tomatoes, olive oil and enjoy! Simplicity and quality can be combined in our catering , see how even the most gourmet friend loves our Iberian ham or our manchego cheese. All our products are gift-wrapped and packed for transport without extra cost. The packaging is adapted to the product size so that you get at home in perfect conditions. The product will be cut just before being vacuum-packed for shipping so that it retains its original quality, aroma and flavour. The product is cut into thin slices just when the order arrives. Vacuum-packed in 100gr sachets just after it’s being cut. This process protects the product and retains all its quality of taste and freshness. The packs are shipped inside a small box with a safety strap for security. This presentation allows you to eat delicious products sliced and with all their aroma and flavour. We recommend you to take the product out of the plastic bag 15 minutes before eating it. The vacuum-packed products we sell can be stored in the fridge for 6 months. Please check the expiry date of each product. The ham will be selected in its optimum curing time just when you order the product. It will be wrapped and packaged for its full protection during transportation. Cotton cover for decoration and conservation. Decorative red, green or yellow mesh. Box with handle for easy and secure transport. A ribbon around the box to ensure transport safety. When you receive the package we recommend unwrapping the ham and placing it in a ham holder or hanging it in a fresh room. Nevertheless, you can keep the product wrapped a few days in a cool room, if necessary. This presentation is ideal for an incredible gift that is always welcome at home. Once you have confirmed your order, it will be prepared and sent via courier. Delivery date and shipping costs depend on destination and weight. During the process you will receive detailed information by e-mail about the status of your order. How long the delivery takes? All items are insured during the delivery. This means that any damage or loss of product is covered.